It seems that the state of the economy is top of mind for just about everyone these days. We hear a lot about how the economy has affected the auto industry, the housing industry, etc. But the reality is that it is impacting just about every industry in the U.S., including the textile industry. U.S. textile mills have been struggling against the influx of goods from textile mills in other countries, particularly India, Pakistan and China, for quite awhile now. According to EconomyWatch, in 2007 production in U.S. textile mills fell by more than 12 percent. ABC News reported that, from October 2007 through October 2008, about 100 textile mills in the U.S. closed, leading to the layoff of over 63,000 U.S. textile workers. Now, with the downturn in the economy over the last six or eight months, things may be getting worse. Longer lead times. In the past, it might have taken two weeks for milling, while now it may take four or six weeks. I cannot say definitively the reason for the longer lead time, but I would guess that it is due to a smaller workforce (layoffs). Less In Stock. Many of the large fabric suppliers are stocking fewer fabrics than they were a few years ago. They just don’t want to tie up as much money in inventory, so they are waiting for firm orders before sourcing the fabric from the mill. For suppliers with multiple stocking locations, they may stock some fabrics in one location only, rather than in several locations across the country. So what does this all mean for the end-user – the school or church wanting new custom stage curtains or the rock band wanting a new custom backdrop? In many cases, it may mean making a choice between waiting longer to get their drapery or choosing a different fabric that is readily available. It may mean paying a higher price for a drapery due to the cost to bring the fabric in from a location out of state. The best thing I can recommend is, be flexible and plan ahead! What is FR? IFR? NFR? Here’s the Scoop. The issue of flame retardancy for stage curtains, trade show drapes, and other hanging drapery is one that I am sure is confusing to many people. I have been educating myself on this subject for a number of years, and I still feel as if I have just scratched the surface. I can’t imagine how difficult it must be for a novice trying to figure it all out, so I thought I’d pass along a little of what I have learned . There are many different topics related to flame retardancy, so I’ll start with the basics and cover more topics in later posts. FR (Flame Retardant): Fabric has been topically treated with a flame retardant chemical, which is water-soluble and will be removed by laundering. Even without laundering, the chemical will dissipate over time, requiring that the drapery be re-treated. Cottons, other natural fiber fabrics, and some synthetic fabrics are topically treated. DFR (Durably Flame Retardant): Fibers have been manufactured with a flame retardant process prior to being woven into fabric. As a result, the fabric is typically flame retardant for the life of the fabric. This is the case for many polyester fabrics (though not all). PFR / IFR (Permanently Flame Retardant): The fibers themselves are non-combustible. Therefore the woven fabric is considered flame retardant for the life of the fabric. This is the case for most Avora™ polyesters, Trevira™ polyesters, some other polyesters, and some other synthetic fabrics. ***DFR, PFR, and IFR are often used interchangeably, because the effect is the same – all are considered flame retardant for the life of the fabric. CBFP / CBFR (Can be Flameproofed / Flame Retarded): The fabric is not flame retardant, but can be topically treated with a chemical to make it flame retardant (FR). This might include a cotton fabric that is usually sold as NFR but can be treated by a registered flame retardancy applicator facility. CNFR (Cannot be Flame Retarded): The fabric is not flame retardant and cannot be topically treated with a chemical for flame retardancy. This includes most fabrics that have metal in the weave. Acetate is another fabric that usually cannot be flame proofed. If you’d like further details on these terms, you can find it here. We send out sample cards frequently to customers, especially for cotton velours. On the back of many of the sample cards, we include construction specifications provided to us by the mill, most of which is probably “greek” to the customer. Weight per linear yard is fairly self-explanatory, as is fiber content, but what about “picks” and “pile ends” and “pile tufts?” In case you were wondering as well, I thought I’d include a brief layman’s explanation. Cotton velour is made of yarns that are woven together. One set of yarns, running lengthwise, is called the warp, while the other set, running crosswise (perpendicular to the warp), is called the weft. In the weaving process, the warp yarns are lifted (called “shedding”), and then the weft yarn is inserted (or “picked”). So, “picks per inch” refers to how many times the weft yarn has been inserted into the warp. The nap of cotton velour is achieved through a specific method of weaving called “pile weaving.” In pile weaving, the warp ends are looped over metal rods or wires during the weaving process. These yarns are called “pile ends,” so “pile ends per inch” describes how many times the warp ends were looped in a linear inch of the fabric. When the metal rods or wires are removed, the surface of the fabric is a series of yarn loops. If left uncut, the finished fabric would be described as having a “loop pile” (picture the loops on the pile of a Berber carpet), but when these pile ends are cut, the final fabric has a “cut pile” (imagine a regular plush carpet). These cut pile ends are called “pile tufts” – essentially, the “nap” in velour or velvet (imagine a regular plush carpet). So, “pile tufts per square inch” refers to how many cut tufts of yarn make up the nap of a single square inch of the fabric. This is a very basic explanation (for more details, here is a still basic but more complete source), but I hope it helps you understand cotton velour a little bit more more, especially when you read the construction specifications on the back of a sample card! A theatre’s proscenium is part of the architecture and therefore it has fixed proportions that cannot be changed. In many production scenarios, however, the scene calls for a reduction in the proscenium opening. For this purpose the teaser and tormentors are placed directly upstage of the structural proscenium opening. Within certain limits the size of any proscenium arch can be altered by using a teaser and tormentors. The teaser is a horizontal masking border that is lowered to reduce the height of the opening. It is attached to a batten and suspended just upstage of the proscenium, directly behind the grand drape or act curtain. The teaser can be lowered into position to set the stage height as required by the current scene. Tormentors or “side maskings” are vertical masking pieces used in conjunction with a teaser. In a traditional setting the tormentors should be mounted upstage of the grand drape and on the same plane as the teaser. While various mounting methods may be used, a tormentor is typically attached to a pipe which is then mounted to a traveler track. The track will allow the tormentors to be drawn onstage to reduce the proscenium opening to fit the current scene. In many installations the pipes will be equipped with a swivel component allowing the tormentors to rotate into an angle, or even reverse to reveal an alternate fabric or finish. Typical Fabric Choices for a teaser or tormentor include velour, either cotton or synthetic, or commando cloth. The teaser may be sewn from a black or neutral colored cloth with fullness. Alternatively it may be made as a solid framed piece with the fabric applied stretched flat. The teaser and tormentor will always be manufactured of the same material. Shane Nelsen, our Creative Director at Sew What?, drew a beautiful rendition of how the different drapes (including teasers and tormentors) appear together on a stage. Take a look at it – it is not only beautiful but a great way to have a visual understanding of how all the different drapes work together. Like the traveler, the tableau curtain (also known as tab curtain) is made up of two curtain panels hung, with center overlap, from a single batten. Each panel is lifted by a diagonal draw line attached to the central edge that runs through rings on the back of the curtain to a pulley on the batten. Typical Fabric Choices for a tab curtain include Cotton Velour and Polyester Velour. 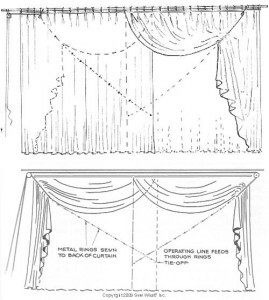 Tab Curtains may be lined or unlined, depending on where the curtains will be hung onstage.